These Tension Tools are for use with Nylon Cable Ties ONLY. 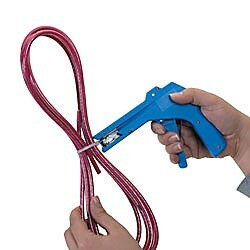 • The P-18 Cable Tie Tension Tool makes it easy to tighten cable ties quickly! And a quick twist is all it takes to snap off excess length. Economical, lightweight and easy to use, the cable tie tool works on cable ties up to 18 lbs. in tensile strength. • The P-50 Cable Tie Tension Tool and M-50 Cable Tie Tension Tool both make installing 18, 40 and 50 lb cable ties in a tremendous range of environments a fast and efficient process every time! Featuring convenient automatic cut-off and adjustable cable tie tensioning capabilities; this exceptionally reliable cable tie installation tool can be easily utilized in a vast array of cable bundling and wire assembly applications. Stainless Steel Cable Tie Tension Tools are for use with Stainless Steel Cable Ties.